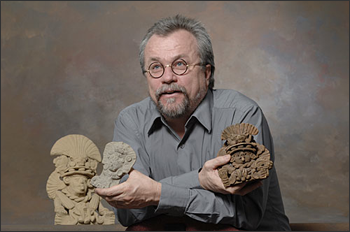 Satellite imagery obtained from NASA will help archeologist Bill Middleton peer into the ancient Mexican past. In a novel archeological application, multi- and hyperspectral data will help build the most accurate and most detailed landscape map that exists of the southern state of Oaxaca, where the Zapotec people formed the first state-level and urban society in Mexico. The process of state formation varied across the Zapotec realm. Sometimes it involved conquest, and other times it was more economically driven. Archeologists like Middleton are interested in different aspects of society that emerged in the process, such as social stratification and the development and intensification of agriculture and economic specialization. Middleton’s study will explore how the Oaxacan economy and environment changed as the Zapotec state grew and then collapsed into smaller city-states. Funding from NASA and National Geographic will also help Middleton build a picture of how climate and vegetation patterns have changed over time. “For the past 4,000 years, human activities have been a factor in environmental change,” Middleton says. “And there are some parts of Mesoamerica that we have pretty good evidence that the environment we see today is the catastrophic result of ancient agricultural practices.” Middleton will focus on two sites in the Chichicapam Valley located in between two of the major arms of the central valleys of Zapotec. The National Geographic-funded portion of the study began last summer when he documented important archeological sites and selected candidates for excavation. Imagery from Earth Observing 1 and Landsat satellites obtained over three years will help Middleton identify the natural resources found at archeological sites. He will work with colleagues John Kerekes and David Messinger along with graduate student Justin Kwon in RIT’s Chester F. Carlson Center for Imaging Science to analyze the large amounts of data taken at different wavelengths of the electromagnetic spectrum. Their own research uses similar techniques to analyze urban landscapes, and inspired Middleton to apply the technology to archeological landscapes. The technology works by differentiating materials on the ground on the basis of reflected light. Objects that look the same in visible light may have very different reflective properties when sampled across the spectrum. “When you put the data back together as a picture you begin to see things you couldn’t see before, and you can make distinctions that to your eyes look the same,” Middleton says. Satellite imagery covering more than 30,000 square kilometers will help Middleton identify different plant species, environments and ecosystems, and acres of arable land or mineral resources surrounding particular sites. “We can start looking at the relationship between ancient cities and ancient human settlements in a way that no one has really been able to do before,” Middleton says. The new landscape map will also show how development has changed the region since the first survey conducted 30 years ago. “We will be able to compare the then-and-now images and be able to make a very good assessment of what we have lost in the past several decades as a result of development,” Middleton says. Another aspect of the NASA-funded project will focus on environmental change. This part of the study, done in conjunction with colleagues at the University of Colorado at Boulder will analyze plant microfossils in sediment samples collected from a variety of locations, including areas where streams expose sediment layers 10,000 years old.